Mid Winter – Adventures of a River Piker This is why I love fishing so much. The last Cod session of winter; live updates from the beach. This weekend may well be the last decent fishing session of the winter, and even then there are no guarantee’s. This is a quick report this morning, as iI am actually writing it sat on Chesil. The conditions are perfect. Coloured water, almost no wind, and only about 1m waves. The only thing missing so far are the fish. I even managed to get some live Peeler. Those of you that are hoping to get out at the weekend, I wish you luck. I think the beaches will be pretty busy. I am not certain how they fishing will be by Sunday, but I don’t think it will be great. Just to let you know Aldi will be selling a range of clothing for fishing, starting on Sunday. As usual with Aldi you get some great bargains. I think I will get myself some of the padded trousers, as mine have finally given up on me. Portland: Rough on the West side and 2m swells on the East, with coloured water, clearing towards Weymouth Bay. Chesil Beach forecast: In the few small windows of opportunity that you might get you will have a good chance of Codling and Rays. Whiting, Pout and Dogfish will also be present. Portland: Coloured water will make good Bull Huss fishing for today and tomorrow, but as the water clears then the Wrasse should start to feed again. Wrasse fishing is normally very good a few days after a storm. Portland Harbour: Quite a few Flounder are showing in the harbour, and this is probably one of the last opportunities to pick up a Bass from the shore for a few months. The water temperature is falling close to 10 degrees and thats normally when they move off. Weymouth Bay: The harbour and pier will produce some Flounder, but the piers will also produce Pout, Pollock Wrasse and Sea Scorpions. If yu like LRF then now is a good time to break out those super light weight rods and tackle and try for as many mini species as you can get. 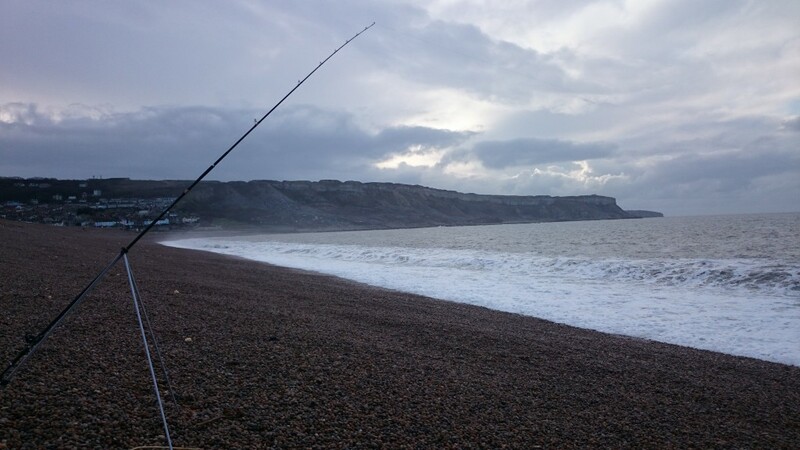 Preston Beach and Bowleaze Cove will produce Flounder, Dab, Whiting and small Bass. Once again, short casts are much better than blasting a bait to the horizon on these marks. Fishing Tails > All Articles > Reports > The last Cod session of winter; live updates from the beach. 2 Responses to "The last Cod session of winter; live updates from the beach."